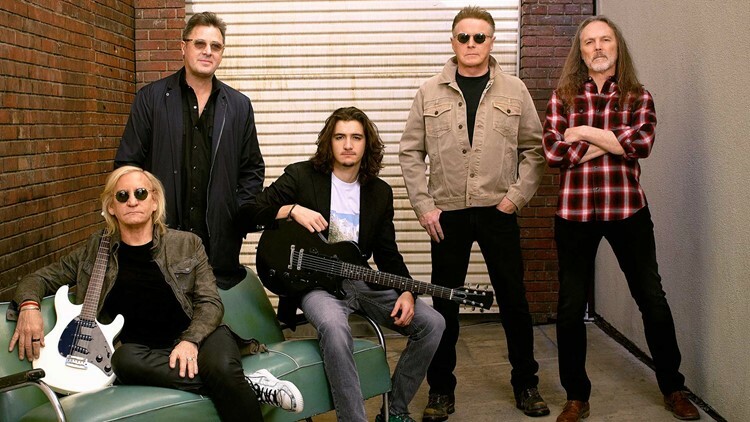 For the first time ever, the Eagles - Don Henley, Joe Walsh and Timothy B. Schmit, with Deacon Frey and Vince Gill - will perform their iconic album “Hotel California” in its entirety for 2 nights only, September 27 and 28, LIVE at the MGM Grand Garden Arena. 2. Eligibility. Subject to the additional restrictions below, the “The Eagles MGM Grand Garden Arena” Sweepstakes (the “Sweepstakes”) is open to legal U.S. residents of the state of California who are 21 years or older at the time of entry. Employees and contractors of KFMB Stations (“Sponsor”), TEGNA Inc., Live Nation, and each of their respective affiliated companies, and advertising and promotional agencies, and the immediate family members of, and any persons domiciled with, any such employees or contractors, are not eligible to enter or to win. 3. How to Enter. The Sweepstakes will begin at 12:00 a.m. P.T. on April 4, 2019 and end at 11:59 p.m. P.T. on April 14, 2019 (the “Sweepstakes Period”). During the Sweepstakes Period, enter by visiting the “The Eagles at MGM Grand Garden Arena” Sweepstakes official registration page on CBS 8 website (cbs8.com) and completing all of the required information and following all posted instructions. Complete the entry form and any other required fields and then submit your entry by clicking on the “SUBMIT” button. Multiple entrants are not permitted to share the same email address. Maximum one (1) entry per person and (1) prize per person. Your computer must accept cookies, or any successor or similar technology, which may be used for the purpose of entry tracking. Ad blocking software on your computer needs to be disabled so that it doesn’t interfere with processing your entry. 4. Winner Selection. On or about Monday, April 15, 2019, one (1) winner will be selected in a random drawing from among all eligible entries. 5. Prize. One (1) winner will each receive two (2) tickets to The Eagles Show on September 27, 2019 at the MGM Grand Garden Arena (3799 S Las Vegas Blvd, Las Vegas, NV 89109); two (2) nights stay at MGM Grand; and one (1) $100 AMEX gift card. ARV: $1,000.00. 6. Winner Notification and Acceptance. Winner will be notified on or about April 15, 2019 at the telephone number, email address and/or U.S. Mail address provided on winner’s entry form. Sponsor will call during regular business hours at number provided on entry form and will leave no messages. Failure to reach winner by phone after three (3) attempts may result in disqualification of winner, forfeiture of his or her interest in all prizes, and selection of a substitute winner from among all remaining eligible entries. To claim prize, each winner must personally visit Sponsor’s offices at the KFMB Stations, 7677 Engineer Road, San Diego, CA 92126 within 30 (thirty) days after notification (office visit must be between the hours of 9 a.m. (P.T.) and 5 p.m. (P.T.) weekdays and must present a valid photo identification. Winners may waive their right to receive prizes. Prizes are nonassignable and nontransferable. No substitutions allowed by winner. Prizes are not redeemable for cash. Prizes and individual components of prize packages are subject to availability and Sponsor reserves the right to substitute prizes of equal or greater value. Prizes not won and claimed by eligible winners in accordance with these Official Rules will not be awarded and will remain the property of Sponsor. 10. Sponsor. The “The Eagles at MGM Grand Garden Arena” Sweepstakes is sponsored by Live Nation and the KFMB Stations. The decisions of Sponsor regarding the selection of winners and all other aspects of the Sweepstakes shall be final and binding in all respects. Sponsor will not be responsible for typographical, printing or other inadvertent errors in these Official Rules or in other materials relating to the Sweepstakes. For a list of winners (available after April 15, 2019) or a copy of these Official Rules, visit cbs8.com or send a self-addressed, stamped envelope to “Winners List/Official Rules” (as applicable), to CBS 8 – The Eagles at MGM Grand Garden Arena, 7677 Engineer Road, San Diego, CA 92111. If you have any questions regarding this Sweepstakes, please contact the KFMB Promotions Department, kfmbpromo@kfmb.com or 858-571-8888.